Oyez! Oyez! Oyez! We command that the peace of our lady the Queen be well kept by night and day but that all manner of whores, thieves, dice players and other unthrifty folk be welcome to the city, whether they come late or early, at the reverence of the High Feast of Yule till the Twelve Days be past. A week ago today, on the streets of York on a dark December evening, I witnessed a rather groovy happening, one I’d not known about before. I can’t quite believe that I didn’t know about it before, and that it’s apparently been happening on 21 December for many years. 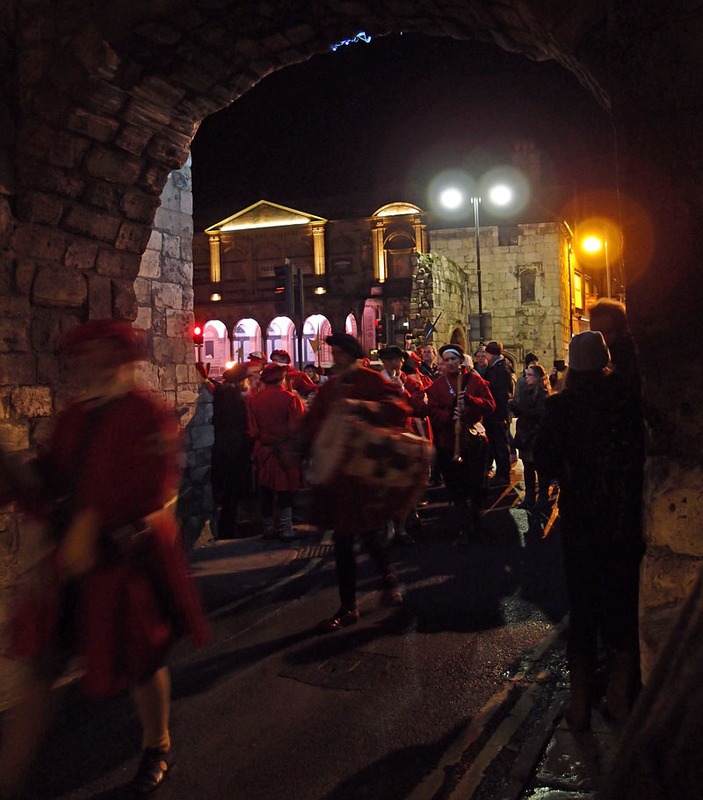 It involved the York Waits, the Sheriff of York Jonathan Tyler, and a load of us walking behind them through the streets, including a couple of people with flaming torches and two costumed women carrying mistletoe. 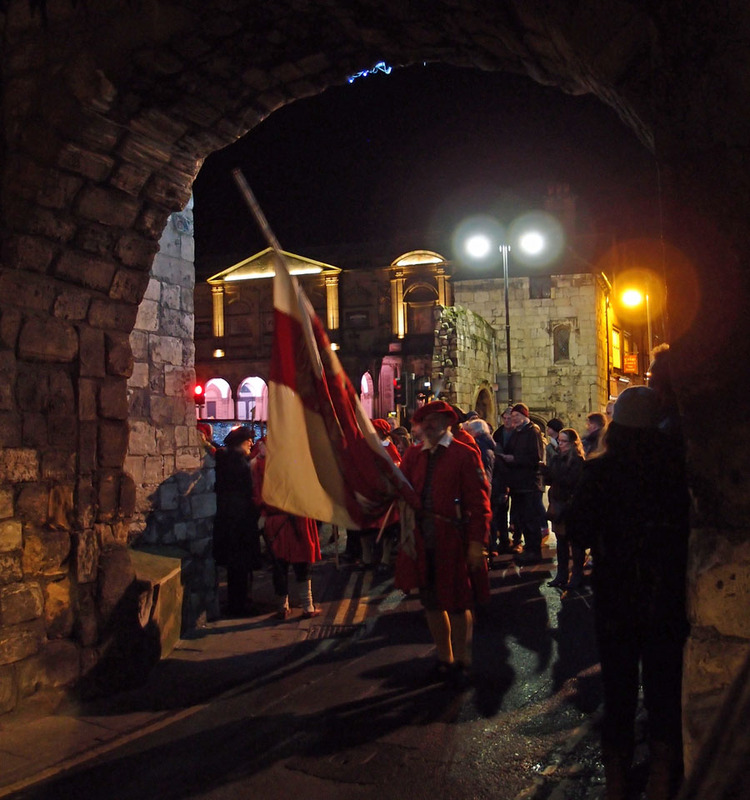 A proclamation was read outside Bootham Bar, about welcoming whores, dice players and thieves, and music played as we walked through the streets, with a closing speech made by the Sheriff, outside the Mansion House. It’s only the last day or two I’ve had chance to read up on what it was all about, and as other people there also seemed confused as to what it was all about, and because it’s such a proper York thing, and we like that kind of thing here on York Stories, I thought I’d write a bit about it … If you’re looking for factual information and background see ‘More information’ at the bottom of the page. Read on for my impressions and emotional waffling. It was a bit of a dash to get there, a last-minute thing. I saw a mention on Twitter of ‘Sheriff’s Riding’, and a tweet from the Mansion House, and a bit of info, and a start time of 6pm at Micklegate Bar. But I couldn’t see myself getting right across to Micklegate Bar for 6. Thanks to someone in the know I got confirmation of what time the whole thing might be arriving at Bootham Bar: 6.30ish. At home I said ‘There’s something going on at Bootham Bar at about 6.30, the York Waits and something about a proclamation, I don’t really know what it is and we might not get there in time but shall we go?’ Which isn’t really selling it, is it. But anyway, it was the winter solstice, and running up Bootham to possibly see a load of people in medieval costumes playing medieval instruments with a proclamation from Bootham Bar sounded like just the kind of thing to be doing on the winter solstice, in the run up to Christmas, and especially after sitting at a computer all day, being serious and concentrating, as I had been. So off we went, in a bit of a dash towards the splendid Bootham Bar, which I think of as ‘my’ bar – not just mine, obviously – but it is the gateway I’ve been going in and out of for about 25 years on my way in and out of town. Getting there we couldn’t see anything going on, so stood about waiting for a bit. A group of people on the opposite pavement seemed similarly confused, and I heard them having a similar conversation about which way the Sheriff and his entourage would go, trying to guess. I was looking at Twitter on the phone, trying to find more information, finding nothing, thinking we’d got there too late. Then the familiar sound, faint, of the York Waits, at the other end of High Petergate, and approaching. Shoppers and people coming out of the pubs turned to see what it was, as these musicians in their red costumes with their strange and wonderful musical instruments passed, behind them a large group of people following, in rather more ordinary 21st century clothing. We followed too, through the archway of the bar. Then the music stopped and a short proclamation was read. Something about welcoming whores and thieves and dice-players and unthrifty people. Two women in costume carrying mistletoe made a suitably cheery and bawdy whooping sound. Then everyone turned around and went back in through the archway, and I stood at the side and took the photo above, and the Sheriff said ‘good evening’ and raised his hat, and then we all followed the music and the drum down High Petergate, past the corner by the Minster, into Low Petergate and Stonegate, and I tried to keep my hair away from the potentially dangerous flaming torch carried by one of the people in the procession, being simultaneously pleased that the carrying of an unsheathed firey thing is still allowed and hasn’t been banned. Along the major shopping thoroughfare of Stonegate we went, drums beating out the pace, and it felt like it was being reclaimed somehow, reminded of its past as an ancient thoroughfare, not just a street of expensive shops. In St Helen’s Square, as we gathered in front of the Mansion House, I thought about how good it is that the Sheriff this year is Jonathan Tyler, who I heard speak at a hustings event last May, at the time of the general election. He did a short speech at the end of this December 2016 event, which made it clear he’d really enjoyed being able to be part of these old traditions, or the modern reinstatement of them — including ‘counting bikes in the Bur Dyke’, on my patch, on the Clifton side of town. I wish I’d known about that. Perhaps not one where the York Waits accompany, and scores of people follow on behind, but perhaps a couple of us could have observed it. Anyway, since the Sheriff’s Riding last week other things intervened, more important than the Sheriff’s Riding and the blowing of Yule horns, so I’ve only just been able to write about it a week on, and thought I would, in the hope that next year it’s a bit easier for interested people to find information on it. This event is exactly the kind of thing the city should be making more of, not for the sake of tourists, but for the people who live here. When I say ‘making more of’ I just mean that I’d have liked to find some information about it online, and to have known about it in advance. Not that I want ‘Make it York’ or some other group to take it over and turn it into a commercial event and start charging us for going. It’s part of our heritage, in its current incarnation, and its original form, which the current version took as inspiration. As our streets fill with the ‘could be anywhere’ kind of stuff these proper York things become more important than ever. And particularly if they’re jolly and particularly if they demonstrate a generous and welcoming attitude to everyone — even the ‘whores’ and the ‘unthrifty’ people, as modern York seems less generous than that. The Christmas chaos theory: article from 2005, by Michael Hickling, in the Yorkshire Post, including the quote used at the top of the page. Sheriff’s Riding, from the York Waits website. ‘The ceremony is based on Yule pageantry as described in detail by Francis Drake in Eboracum, 1736′. Hurrah for the York Waits, Yule pageantry, and special appreciation for York historian Francis Drake, for writing it all down in detail so we could do it again more recently. By Lisa @YorkStories • 28 December 2016 Happenings & events, Histories To link to this page's proper location please use the > permalink.